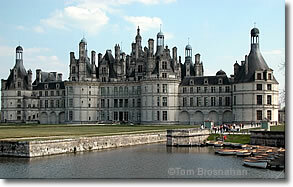 Visitors go to Chambord to see its famous Château de Chambord, the largest castle in the Loire Valley. Set in its own vast park and hunting-ground, surrounded by a moat (map), the château is unlike others because there is no town in the immediate vicinity. When you are going to Chambord, you are going to visit the castle. You must look for other services such as hotels, restaurants, shops and transport elsewhere.